RISCA’s State Cultural Facilities Grant Application is Live and Ready for YOUR Application! RISCA’s State Cultural Facilities Grant application for this year is live and ready when you are to prepare YOUR cultural facilities grant application. The deadline for applications is October 1, 2017, with an online Letter of Intent (LOI) due by September 1. If you are applying for more than $250,000, your LOI is due by August 1. 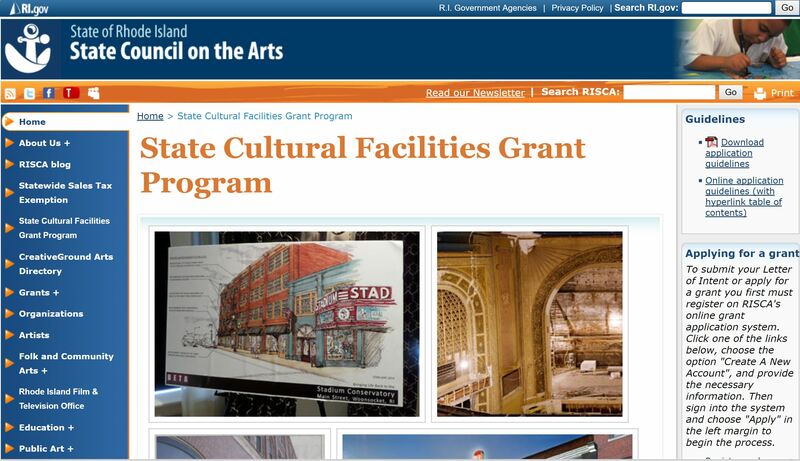 The State Cultural Facilities Grant program helps to support cultural facilities capital improvements to arts and cultural facilities in Rhode Island. Supported by a $30 million bond initiative in 2014, RISCA’s program has funded close to 50 projects in communities throughout the Ocean State. We anticipate awarded close to $2.5 million in matching grants to organizations applying at the October 1 deadline.